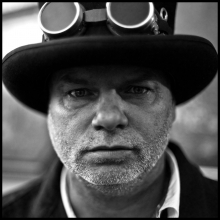 Rootsy rocker Fred Eaglesmith is heading to Glasgow early in 2016 for his first show in the city for three years. The Canadian singer/songwriter, who clocks up around 180 gigs a year on the road, will play The Admiral Bar on March 19. He delivers his dazzling lyrics in a distinctive gravel voice, often wearing outlandish headgear: but he never fails to thrill his fans, known everywhere as “Fredheads”. Bigger name stars such as Toby Keith, Alan Jackson, Dar Williams and The Cowboy Junkies are among those who have recorded covers of his meaningful and well-crafted songs over the years. “There is never a dull moment at a Fred Eaglesmith show,” said Kevin Morris, Fallen Angels Club director. “If you’re missing out on Eaglesmith, you’re really missing out…” – New Yorker magazine.